Post Rock seems to be a popular genre these days, at least by the numbers of releases, but as is often the case, plenty of uninspiring releases overwhelm the market making it hard to find the few real gems – if you are not totally obsessed with searching the Internet for underground bands. The sheer mass of releases is not the only problem. While Post Rock aims to leave the common musical structures of the mainstream behind, this is not always the case and too many releases dwell on endless boring clean guitar riffs which differ in very few elements. An unexpected exception is Germany‘s Morning Mode, from the Mainz/Wiesbaden area in the middle west of the country; four guys (two guitars, bass and drums) creating a Post Rock sound carpet of special beauty. The absence of a voice is well known to the genre, and commonly accepted by listeners of progressive music, but I can‘t help think that in this example having no vocals does really make a difference. 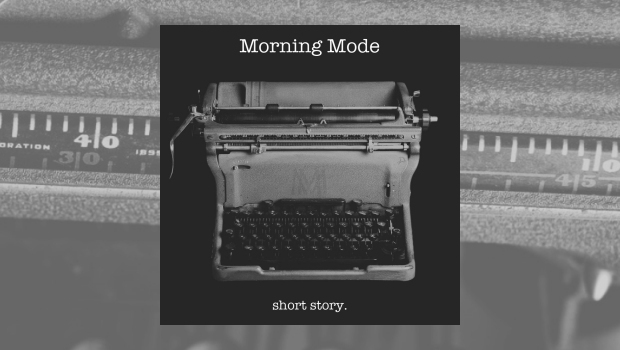 Of course, nothing is harder to take than divine music mixed with a poor singer, but Morning Mode are just the right example to show that there is, under certain circumstances, absolutely no need for vocals. Taking their song motif as an example, over 12-minutes long with a rock guitar part to start. Over the crispy riff the second guitar layers a lead melody which evolves with the part beneath. This is generally the secret of Morning Mode’s way of making music: evolution. Another typical element also features in motif, the transition into a clean guitar part which offers the possibility to evolve again, to rebuild the song. That might not be unusual in this genre, but the length of the song seems to provide the opportunity to work with bigger, bulkier structures. An interesting aspect of the band’s music is how they manage to do this in such an elegant way – the music kind of floats through the ear. After a calmer riff, the song rebuilds again in the last quarter with a small burst of aggression (not to be mistaken for brutality, the song is just taking a step forward) and evolves again in the most organic progression. At no point does the music appear to be unnaturally constructed, it just takes the listener on a journey. There are no verses or refrains but it does not bore at any time. Drummer David Stahl doesn’t bore either: I would call some of his fills a little unorthodox, but they always serve the song and never disturb its progress. None of the instrumentalists use the foreground merely to show off their skills and techniques, the song remaining the absolute priority, and listeners searching for virtuoso excess will be disappointed. Likewise, it is fascinating that a song that lasts over twelve minutes seems to pass in only a few moments. In contrast, other bands – especially from the tech sector – can compose three-minute songs which will feel like they go on for hours because they are overloaded in every aspect. This is not to say that Morning Mode’s music is thin, just more laid-back – a relaxed morning mode would be the perfect analogy! Few bands have names which transfer into the music in such an appropriate way. I have no idea what songwriting process the guys use so it is pure speculation, but I would bet that they work a little with associations, something that I believe Mastodon do and it seems to work very well for them. If you have the need to compare Morning Mode’s music I would think of Tides of Nebula from Poland, but Morning Mode have a little more of a ‘rock‘ approach, listing on their website influences such as Karnivool, Porcupine Tree, Oceansize and Dredg, although they do not sound like mere derivatives of these popular ancestors and the ‘missing’ vocals mean that the guitars hold a different position to those bands; they ‘sing’ – and the melodies are really beautiful and inventive. The shape of Morning Mode’s sound suggests that the band hasn’t invested heavily in an expensive studio and an expert recording engineer, but it is certainly top class in the field of ‘home recording’ and it probably isn’t fair to consider it as such given the quality presented. They use individually chosen effects for every riff and do not tend to go for a digital mishmash, reasoned sound arrangements being obvious, and friends of the common pedalboard can play along with a game of ‘Name That Pedal’. Short Story is the band’s second EP, and at nearly 40-minutes long it’s very good value. Fully downloadable on Morning Mode’s website and available for ‘name your price’ on Bandcamp, it underlines the assumption that these guys do not make a living from their music. For a group of hobby musicians, I cannot think of a better outcome. It’s a pearl of the underground universe and I hope it will see more of the wider world. And maybe then Morning Mode will do an album. How long might that be? !